The Axe Core Wallet is an application that runs on your computer and allows you to make transactions on the Axe network. 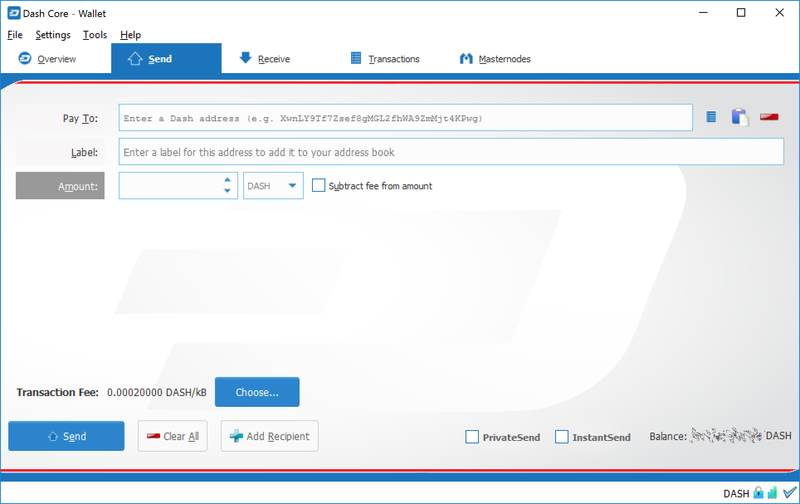 Most transactions are for sending or receiving Axe, but it is also possible to create signed messages or control a masternode, for example. The Axe Core Wallet interface is described in detail in the following sections. The File menu is used to manage your wallet, messages and addresses. The Settings menu provides access to wallet encryption options and general software settings. The Tools menu provides information on the network, allows you modify masternode configuration files and other advanced functions. The Help menu links to documentation, guides and legal statements relating to Axe Core. The overview tab offers quick access to your balance and most recent transactions, as well as the PrivateSend feature and options for coin mixing. This shows your current liquid balance. This is the amount of Axe you can spend now. This shows funds waiting for a transaction to complete. This shows funds from masternode or mining payments which have not yet reached the required number of confirmations. This is simply your available and pending funds added together. The lower area shows the status of PrivateSend and allows you to mix your funds using the Axe Masternode Network. 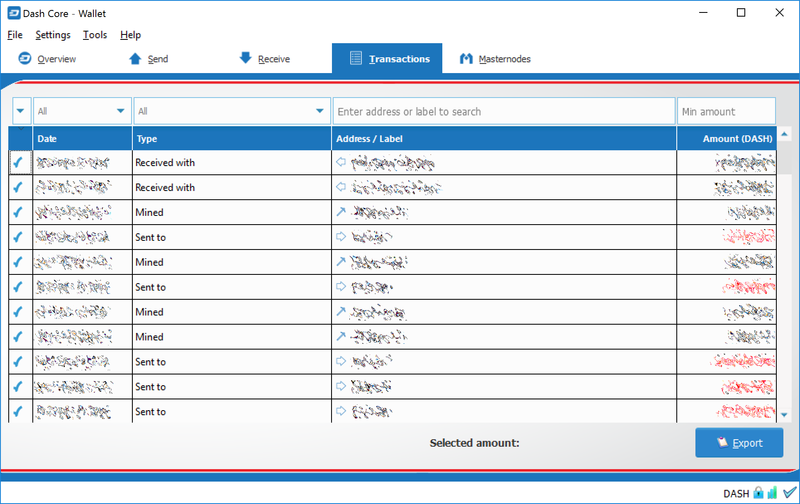 For more details on your transaction history, see the Transactions tab. 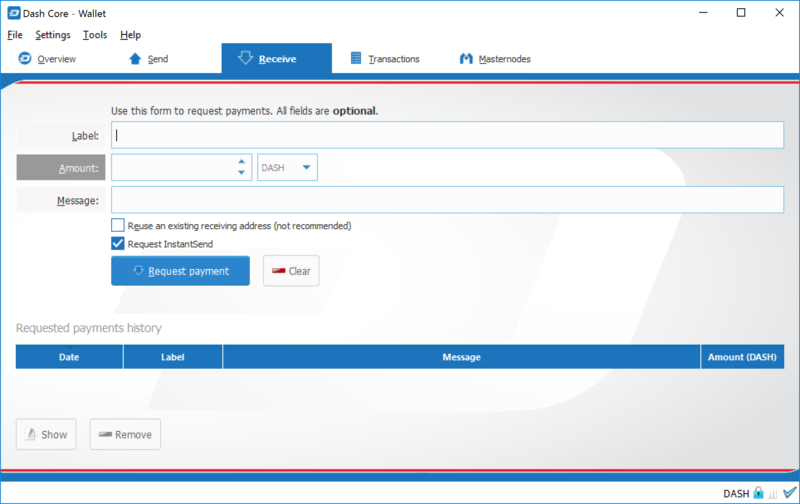 The Send tab allows you to send funds to another address on the Axe network. It contains fields to enter the recipient’s address, a label for the address, and the amount of Axe you wish to send. Options related to the transaction fee, InstantSend and PrivateSend are also available. A quick view of your total balance is also available in the lower right corner. The Receive tab allows you to create addresses to receive Axe. You can create a request for a specific amount of Axe or include a specific message, and send it to another user as a link or QR code. The transactions tab shows the entire transaction history for all addresses associated with your wallet. This appears as a table showing the time, type, label and amount of Axe for each transaction. You can also export the transaction history as a CSV file by clicking the Export button in the bottom right corner of the window. The icons in the leftmost column indicate the status of the transaction. A tick indicates that the recommended number of confirmations has been passed, while a clock indicates that the transaction has yet to reach six confirmations. The status bar shows a synchronization progress bar and a row of status icons which indicate the status of your connection to the Axe network. This occurs if your internet connection is down, or if the ports required by Axe Core are blocked by a firewall. Axe Core is downloading blocks from the network. Axe Core is synchronizing other data with the second layer network. Once synchronization is complete, the progress bar will disappear and a tick will appear on the right of the status bar. The lock icons indicate the status of your wallet: either locked or unlocked. You need to unlock your wallet to send funds or perform certain other actions. These icons indicate the quality of your connection to the Axe network. If you cannot connect because of network problems, you will see the icon on the left. More bars indicate more connections to your peers on the network. These icons show the synchronization status of Axe Core with the network. Once synchronization is complete, the refresh icon will become a blue tick. These icons indicate whether your wallet is running in hierarchical deterministic (HD) mode or standard mode. 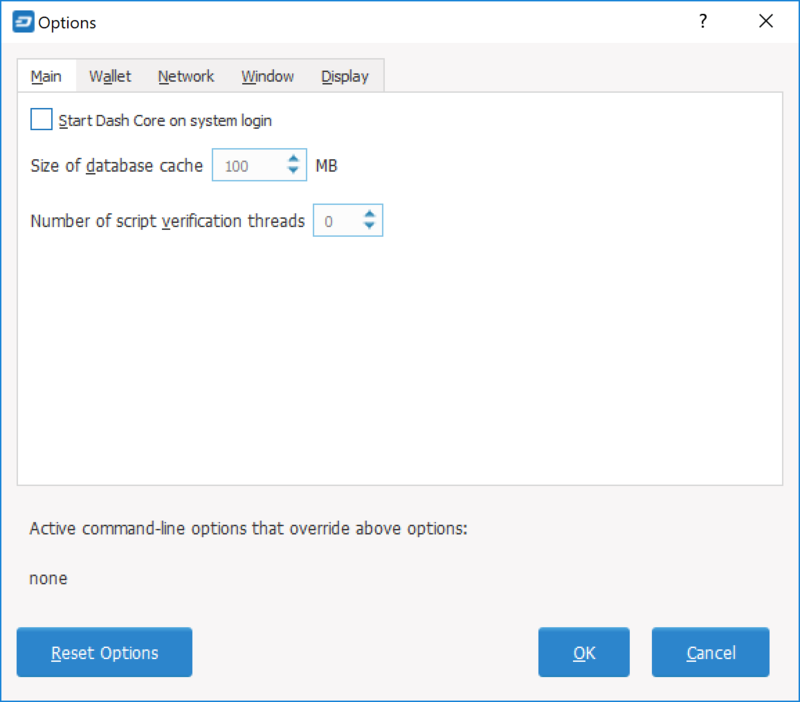 This documentation describes the functionality of the Axe Core Options dialog, available under the Settings > Options menu in Axe Core. The Main tab of the Options dialog contains settings related to startup and performance of the Axe Core app. This option causes Axe Core to start automatically when the current user logs in. On most computers there is only one main user account which is logged in automatically when the computer turns on, so this option is effectively the same as starting Axe Core together with the operating system. This option specifies the size of the database cache in memory. A higher value will result in increased performance when adding new blocks at the cost of higher memory usage. The default value is 100MB and it should not be set lower than this level. This option sets the number of script verification threads, ranging from -4 to 16. Script verification is the process of following instructions recorded in the blockchain to ensure the transactions are valid. 0 means automatic and will allow script verification to scale to the number of cores available on your processor. Setting a positive number specifies that Axe Core should use that number of processor cores, while setting a negative number will leave that number of processor cores free. The Wallet tab of the Options dialog contains settings related to how addresses are managed in the Axe Core app. The first time you run Axe Core, it will generate a new wallet containing 1000 unique Axe addresses. This tab allows you to configure how these addresses are used as inputs with the Coin Control, PrivateSend and Masternode features. Your Axe Core wallet balance is actually the sum total of all addresses holding balance that are associated with your wallet. When you spend Axe, Axe Core will withdraw from as many inputs as necessary to make up the desired amount of Axe to be transferred. This behavior may be undesirable if you want to keep a certain balance on one address. The most common use case is the requirement to maintain 1000 Axe on a single address as collateral for a masternode. Enabling this option will add a button labelled Inputs on the Send tab. This provides access to the Coin selection dialog, which can be used to lock, unlock and prioritize different addresses in your wallet. See here for a more detailed explanation of Coin Control. 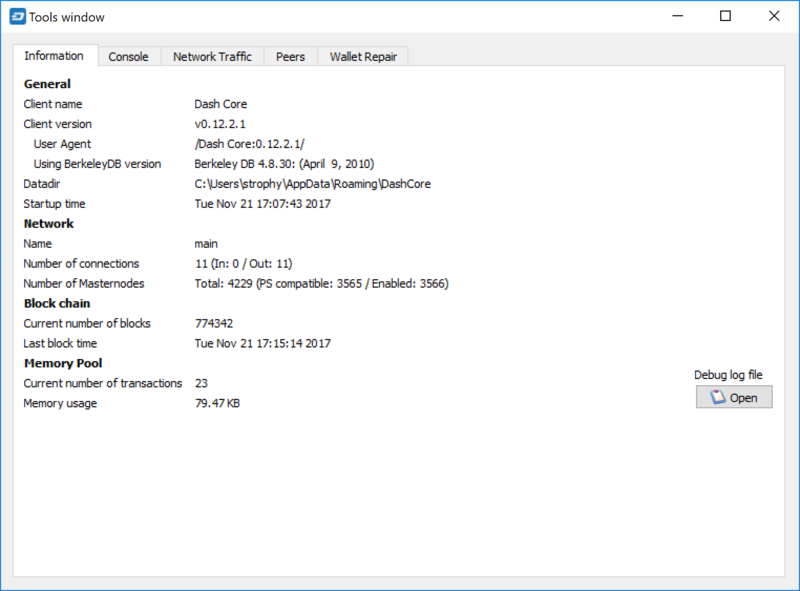 Enabling this option causes Axe Core to display an additional Masternodes tab to the right of the Transactions tab. This option requires you to restart the Axe Core app. The Masternodes tab can be used to manage interactions (start, stop, check status, etc.) with masternodes controlled by this wallet. 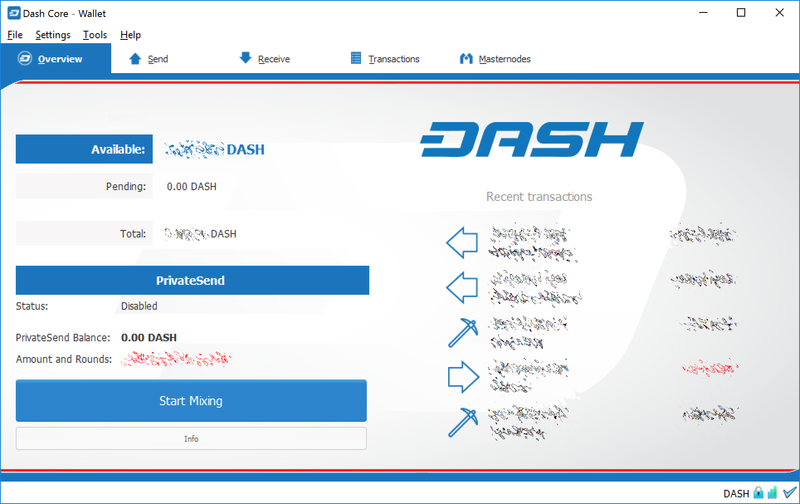 This tab is an advanced feature not required by users that do not operate a masternode on the Axe network. Enabling this option changes the PrivateSend mixing interface on the Overview tab of the Axe Core wallet to include more options, such as Try Mix and percentage completion. See here for a full explanation of how to use PrivateSend. Enabling this option will cause Axe Core to display a warning when your original set of 1000 addresses is running out, which may affect PrivateSend mixing. Every time a mixing event happens, up to 9 of your addresses are used up. This means those 1000 addresses last for about 100 mixing events. When 900 of them are used, your wallet must create more addresses. It can only do this, however, if you have automatic backups enabled. Consequently, users who have backups disabled will also have PrivateSend disabled. Normally PrivateSend mixing is completed in several consecutive rounds, each using a single masternode. Enabling this option allows multi-session, which means you can use multiple masternode servers at the same time, greatly increasing the speed of the mixing process at the cost of creating more addresses and thus requiring more frequent wallet backups. This feature is experimental as of Axe Core 12.1.5. When this option is enabled, the Axe Core wallet permits you to immediately spend change from previous transactions that has been transferred internally between addresses associated with the same wallet. This is possible even if the transaction has not yet been confirmed because the wallet knows it will eventually be confirmed since it created the internal transaction itself. 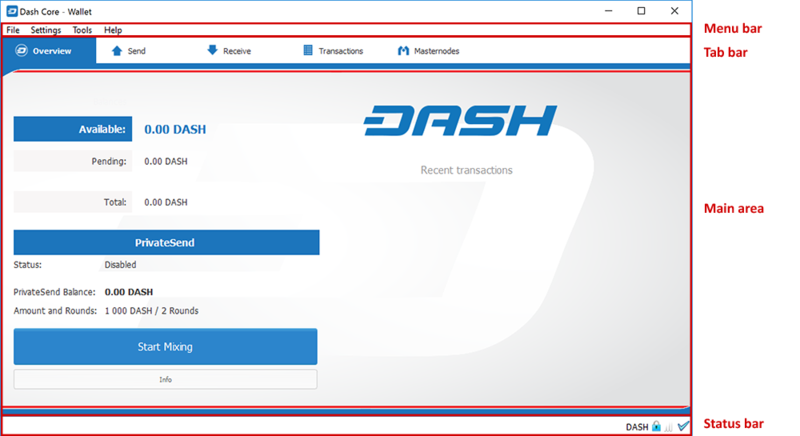 Leaving this option enabled allows you to create new transactions even if previous transactions have not yet been confirmed. Use this option to control the number of rounds of PrivateSend mixing to be carried out for your chosen balance. Each round of mixing uses a new masternode. The higher the number of rounds, the more difficult it becomes to trace the Axe to its original address. This is at the expense of more time required for mixing and potentially higher fees. See here for a full explanation of how to use PrivateSend. This option allows you to specify how much Axe should be kept on balance in a ready-to-use anonymized state, meaning it has already passed through the PrivateSend mixing process. If you do not have sufficient Axe available in your balance of unlocked inputs, the amount will be automatically reduced to the available balance and shown in red in the PrivateSend interface on the Overview tab. This tab includes options related to how your connection to the Axe network is made. This option causes Axe Core to automatically attempt to open and map the client port on your router using UPnP (Universal Plug and Play). This feature is supported by most modern home routers and will allow you to connect to the Axe network without making any special settings on your router. This option causes your client to accept external connections. Since Axe is a peer-to-peer network and Axe Core is considered a full client because it stores a copy of the blockchain on your device, enabling this option helps other clients synchronize the blockchain and network through your node. These options allow users on an intranet requiring a proxy to reach the broader internet to specify the address of their proxy server to relay requests to the internet. Contact your system administrator or check out the network settings in your web browser if you are unable to connect and suspect a proxy may be the source of the problem. 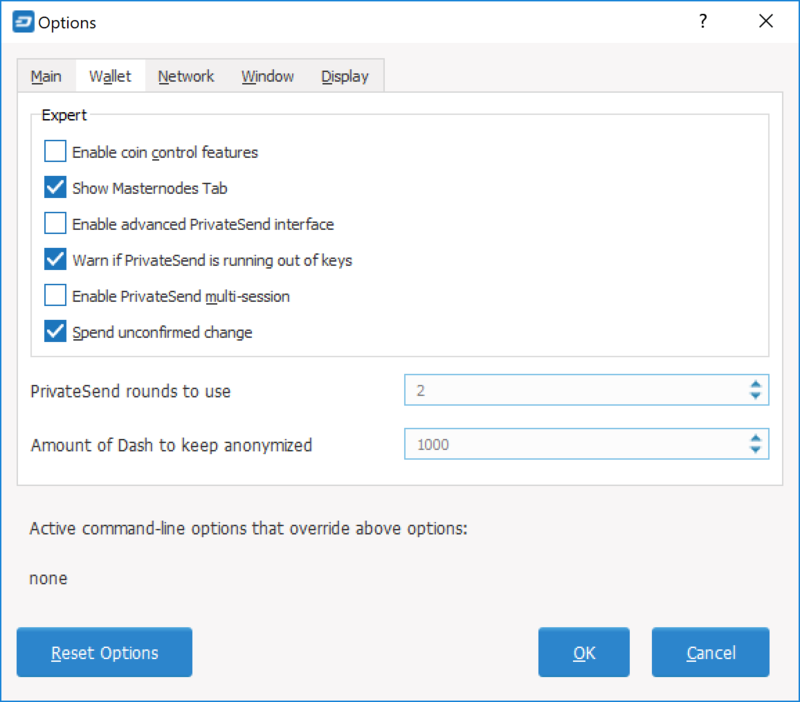 These options allow you to specify an additional proxy server designed to help you connect to peers on the Tor network. This is an advanced option for increased privacy and requires a Tor proxy on your network. For more information about Tor, see here. This option contains options governing behavior of the Axe Core app window under Microsoft Windows. When this option is enabled, Axe Core will not display an icon in the system tray. 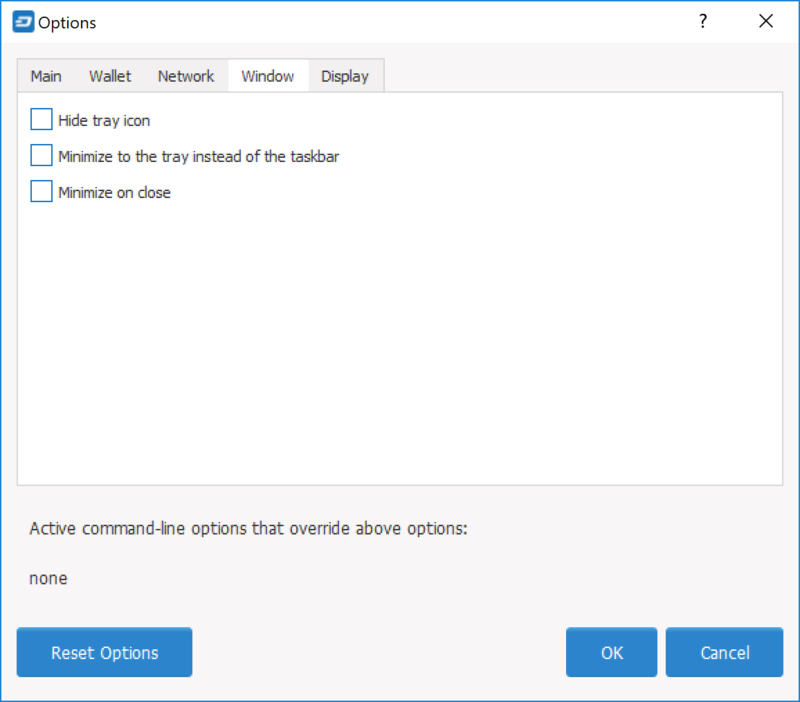 This option cannot be selected at the same time as Minimize to the tray instead of the taskbar. When this option is enabled and the Axe Core window is minimized, it will no longer appear in your taskbar as a running task. Instead, Axe Core will keep running in the background and can be re-opened from the Axe icon in the system tray (the area next to your system clock). This option cannot be selected at the same time as Hide tray icon. When this option is enabled, clicking the X button in the top right corner of the window will cause Axe Core to minimize rather than close. To completely close the app, select File > Exit. This tab contains options relating to the appearance of the Axe Core app window. Select your preferred language from this drop-down menu. Changing the language requires you to restart the Axe Core app. You can use this option to select a different theme governing the appearance of the Axe Core window. All functionality is identical under the different themes, although the default Axe-light theme is most recent and most likely to work without any display artifacts. This allows you to change the default unit of currency in Axe Core from AXE to mAXE, µAXE or duffs. Each unit shifts the decimal separator three places to the right. Duffs are the smallest unit into which Axe may be separated. This option allows you to select how many decimal digits will be displayed in the user interface. This does not affect internal accounting of your inputs and balance. This option allows you to specify and external website to inspect a particular address or transaction on the blockchain. Several blockchain explorers are available for this. To use this feature, enter the URL of your favorite blockchain explorer, replacing the %s with the transaction ID. You will then be able to access this blockchain explorer directly from Axe Core using the context menu of any given transaction. This documentation describes the functionality of the Axe Core Tools dialog, available under the Tools menu in Axe Core. This section displays information on the name and version of the client and database, and the location of the current application data directory. This section displays information and statistics on the network to which you are connected. This section shows the current status of the blockchain. This section shows the status of the memory pool, which contains transactions that could not yet be written to a block. This includes both transactions created since the last block and transactions which could not be entered in the last block because it was full. This button opens debug.log from the application data directory. This file contains output from Axe Core which may help to diagnose errors. 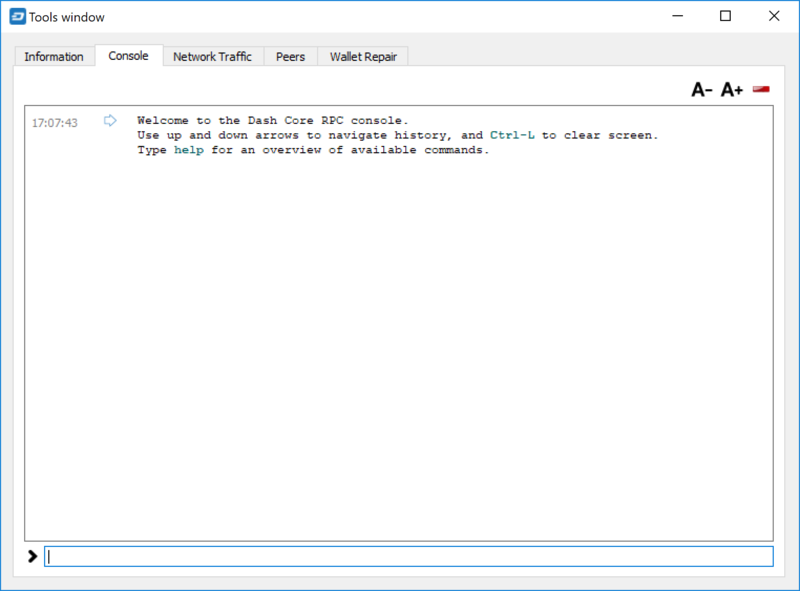 The Console tab provides an interface with the Axe Core RPC (remote procedure call) console. This is equivalent to the axe-cli command on headless versions of Axe, such as axed running on a masternode. Click the red – icon to clear the console, and see the detailed documentation on RPC commands to learn about the possible commands you can issue. 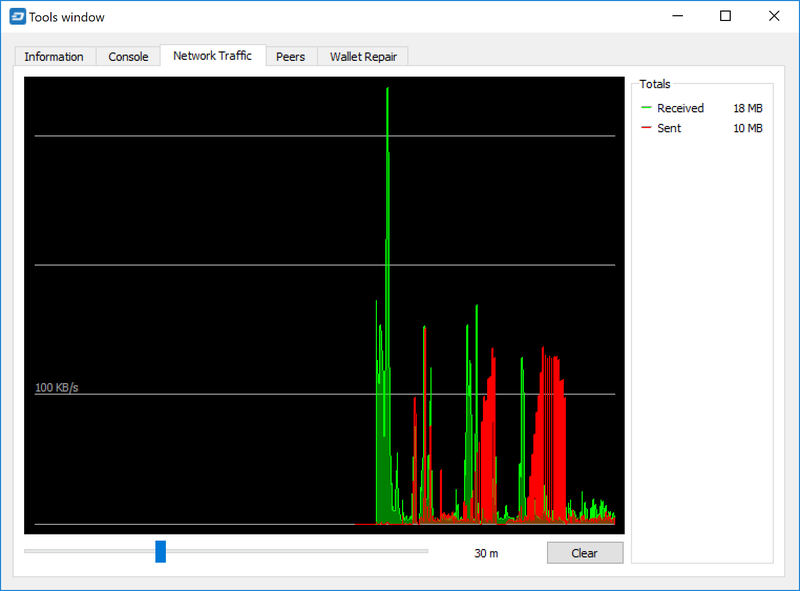 The Network Traffic tab shows a graph of traffic sent and received to peers on the network over time. You can adjust the time period using the slider or Clear the graph. 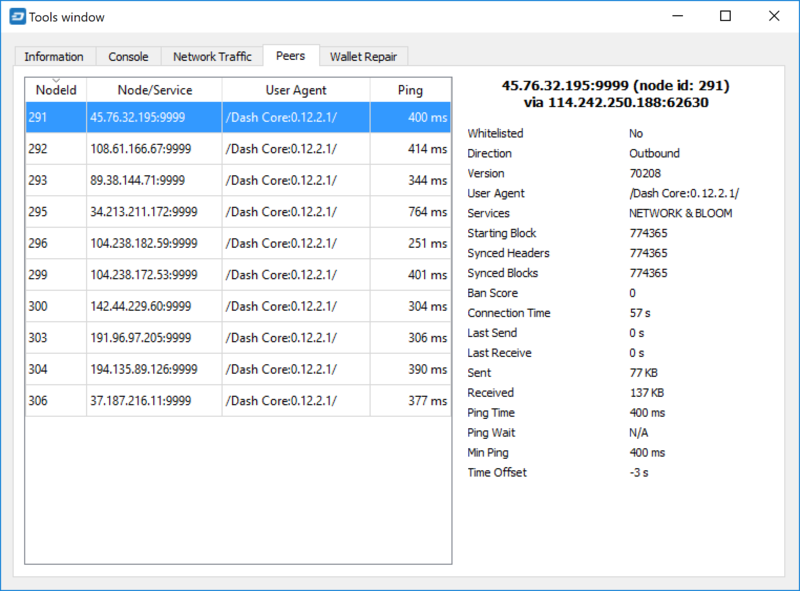 The Peers tab shows a list of other full nodes connected to your Axe Core client. The IP address, version and ping time are visible. Selecting a peer shows additional information on the data exchanged with that peer. The Wallet Repair tab offers a range of startup commands to restore a wallet to a functional state. Selecting any of these commands will restart Axe Core with the specified command-line option. Salvage wallet assumes wallet.dat is corrupted and cannot be read. It makes a copy of wallet.dat to wallet.<date>.bak and scans it to attempt to recover any private keys. Check your debug.log file after running salvage wallet and look for lines beginning with “Salvage” for more information on operations completed. Rescans the already downloaded blockchain for any transactions affecting accounts contained in the wallet. This may be necessary if you replace your wallet.dat file with a different wallet or a backup - the wallet logic will not know about these transactions, so a rescan is necessary to determine balances. The recover transactions commands can be used to remove unconfirmed transactions from the memory pool. Your wallet will restart and rescan the blockchain, recovering existing transactions and removing unconfirmed transactions. Transactions may become stuck in an unconfirmed state if there is a conflict in protocol versions on the network during PrivateSend mixing, for example, or if a transaction is sent with insufficient fees when blocks are full. 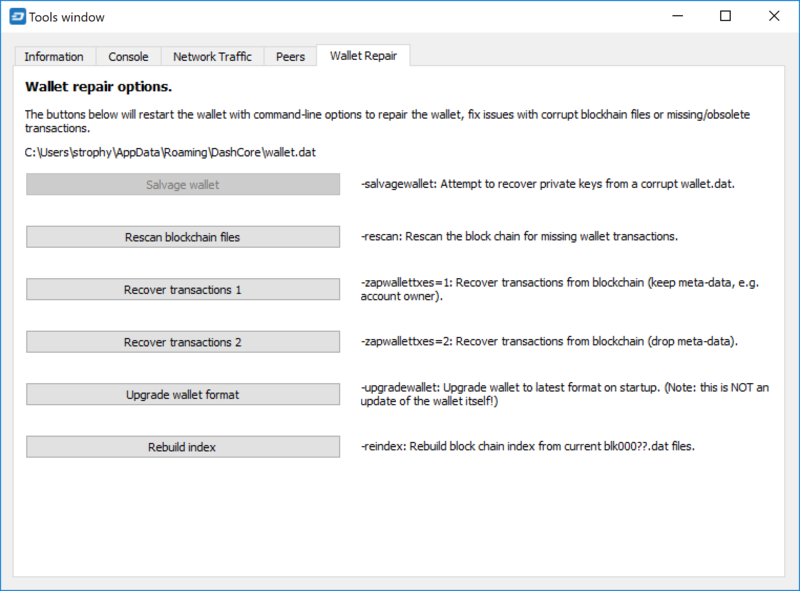 This command is available for very old wallets where an upgrade to the wallet version is required in addition to an update to the wallet software. You can view your current wallet version by running the getwalletinfo command in the console. Discards the current blockchain and chainstate indexes (the database of unspent transaction outputs) and rebuilds it from existing block files. This can be useful to recover missing or stuck balances.